I saw a kid tenderly wipe lemon juice across another kid’s eyelashes today. That’s crazy, all of it. Kids (teenage boys) being tender to each other, that’s just Chile (when they’re not beating the crap out of each other or hurling homophobic insults), and someone willingly let someone else rub lemon juice into his eyes? Well, that’s just protest talking. Lemon juice is supposed to help when you get teargassed. And this kid had gotten it straight in the pepas (slang for eyes). 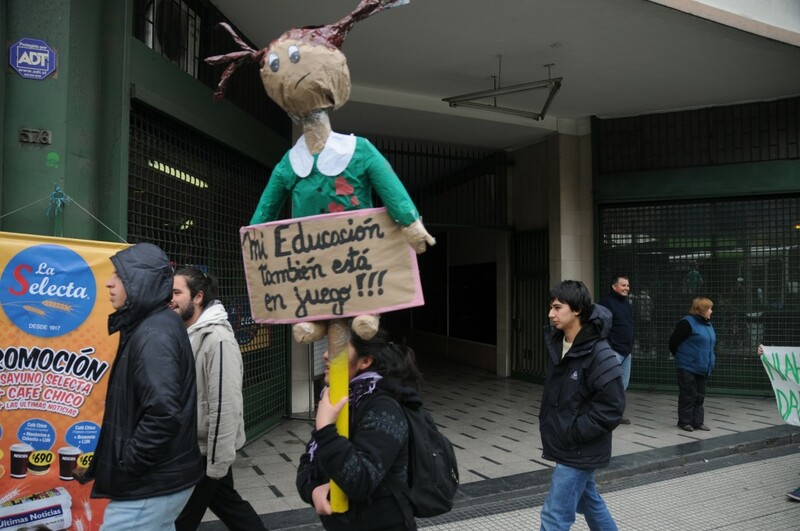 My entire day today consisted of going to, being at, running away from, taking pictures of, and finally, writing about the massive Chilean protest for educational reform. It’s been a long time coming, the second of (I think) two, and after weeks of paros (stoppages), where students have taken over school buildings, and essentially paralyzed the (university) educational system. It’s not something I know from home, but here it’s expected, almost familiar. And I have written here about what it feels like to be at a protest, and here too, but that one was at night, and the police were much more aggressive. It was scary. Today’s was lighthearted, tremendously entertaining, at times tender (see, boys with the lemon juice), and just powerful. I took a tremendous number of photos, none of which turned out particularly stunning. I think I need to practice crowd shots more. 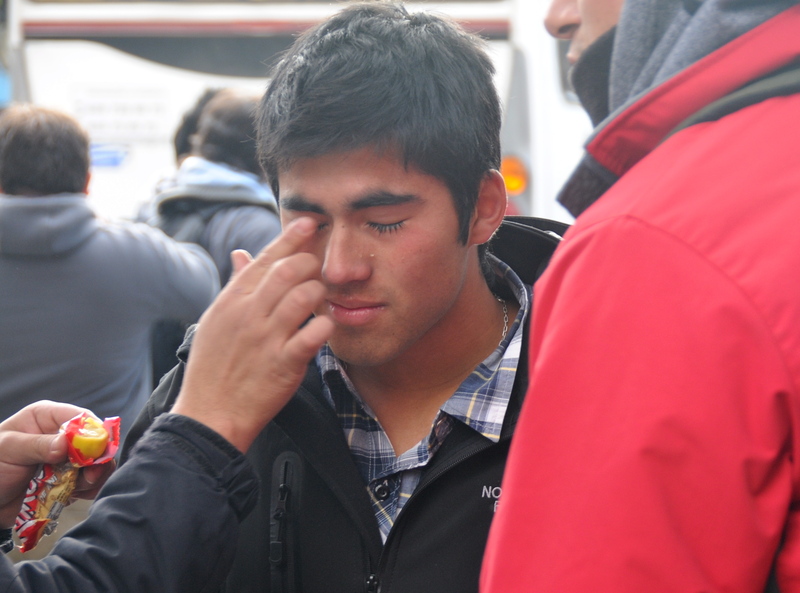 And shooting with my eyes closed because of the teargas. But I digress. I wrote something very balanced, and vey fair for Matador. You can go read (and like and tweet and plus one and stumble and digg and whatever else one can do to a story these days) here. So many of the pictures I took I wish I could talk to you about. And it’s my blog, so I will. All these other countries have free education. And Chile, when? Her education is also at stake. (some word play here about the word juego (game) I think). 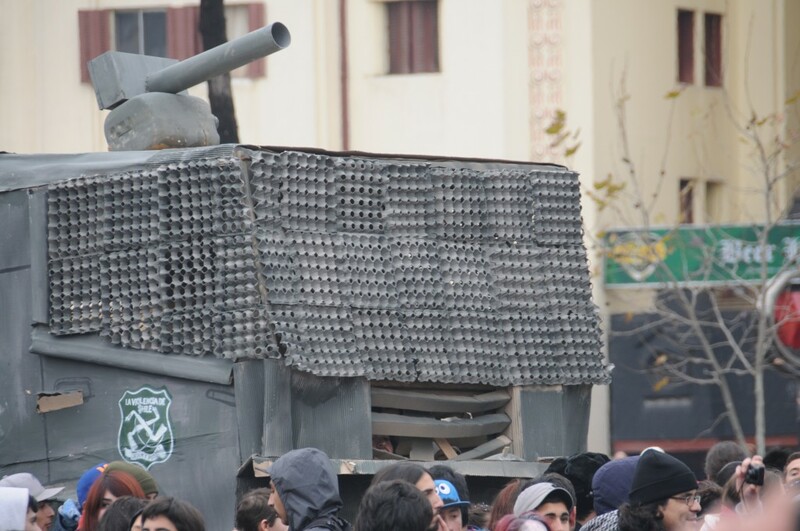 Giant, massive creativity points for this fake “guanaco” (water cannon) made out of cardboard and eggflats. Not sure about the SS insignia on the side though, kind of creepy. A “for everything else there’s mastercard”-slash-priceless rip off. It’s pretty funny. This couple was the media darlings, grandparents supporting their grandchildren. I shall now pause while you saw awwwww. And here’s a crowdshot that shows just a tiny drop of the number of people that were there. For more, including fire, brimstone, teargas and whatnot (without the brimstone), check out this set on Flickr. It’s definitely interesting to be living in a country where there are almost constant protests. With HidroAysén now being “reviewed” by the courts, attention is focused on the student issue. I have to wonder how it will end. Where does the money come from for “free” education? While the government ponders this, students are losing precious classtime which will have to be made up, somewhere, somehow. I have no answers, only questions. It is very interesting. And I don’t know precisely where the money comes, but more transparency, and better access to education are definitely on the short list of things that need to happen here. I don’t have any answers either, sadly. I love the photo of the Guanaco… and impressed by their creativity. Yes, the protesters were incredibly creative. Dancing, singing, etc. 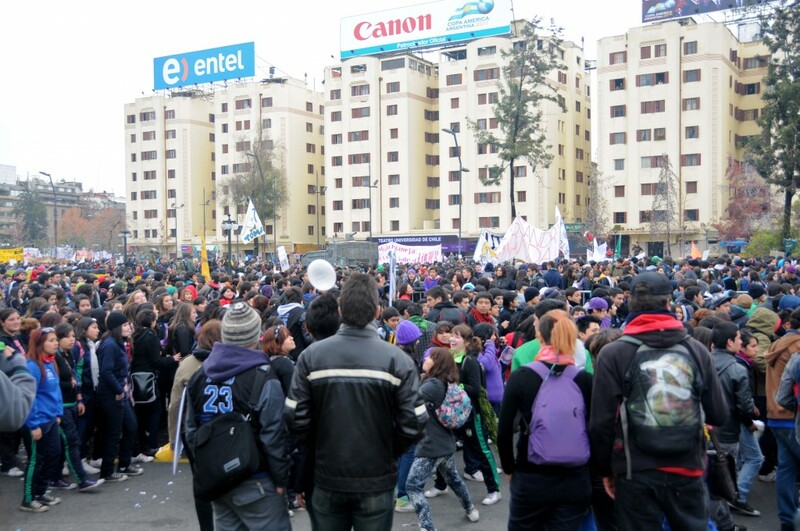 Don’t miss my official Matador story, which I’m linking to right now in the text, but here it is: http://matadornetwork.com/network/vast-march-for-educational-reform-in-chile/ In general, things were very peaceful and positive. What I love about the student protests is how creative they are with their slogans, puppets, dancing, chanting, etc. At least down by U. Catolica, everyone was in high spirits and there was such a good energy in the air. Maybe I’m cynical, but what makes me so sad is the unlikelihood of real change. I’m not sure how different these protests are compared to 2006, because I wasn’t here, but after the Revolución Pinguina, so much change was promised and they changed the name of the main education law, but nothing changed in practice. It’s time to stop putting a band aid on a system that is completely broken and needs structural reform. Ok, I’ll get off my soap box now. Great pictures! the creativity was off the hook. I loved that guanaco. There were also two sets of two kids dressed as guanacos, which were pretty hilarious, they ran aroud in circles. You can see them in the flickr set. Glad you were on the scene and reporting back! I haven’t made it to any of the current round of marches, but worked downtown 5 years ago during the whole Pingüino movement and I tell ya, it got pretty scary walking out into the remains of the day, when Santa Rosa looked like an abandoned battlefield, littered with rocks, burning tires, broken glass, and giant police buses and water canons. The disturbios were not menores, but the protagonists were the same as always. Most of the march was peaceful and uneventful, and then these clowns got in on the act. It’s always that way, but I’m still glad the marches happen. It’s important for Lavin to see what people want, what they’re capable of. 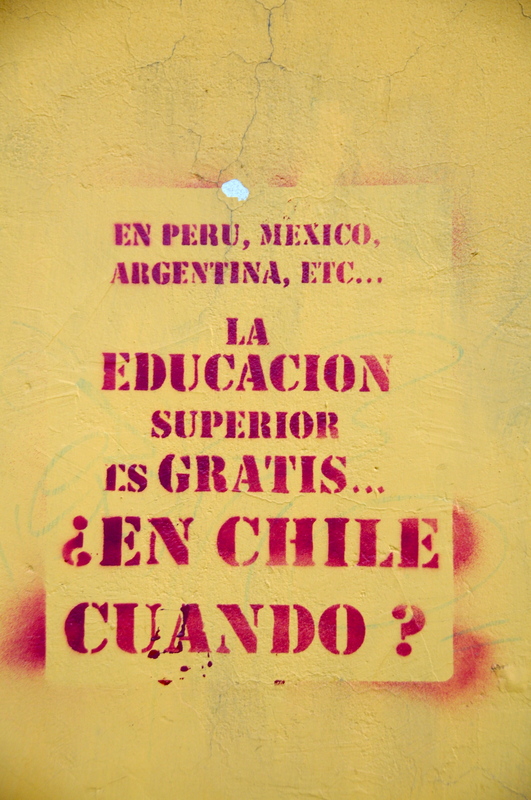 And Chile’s education is crazy expensive. I hope they do find a solution, but I’m pretty sure it’s not going to happen under this government! Great pictures! 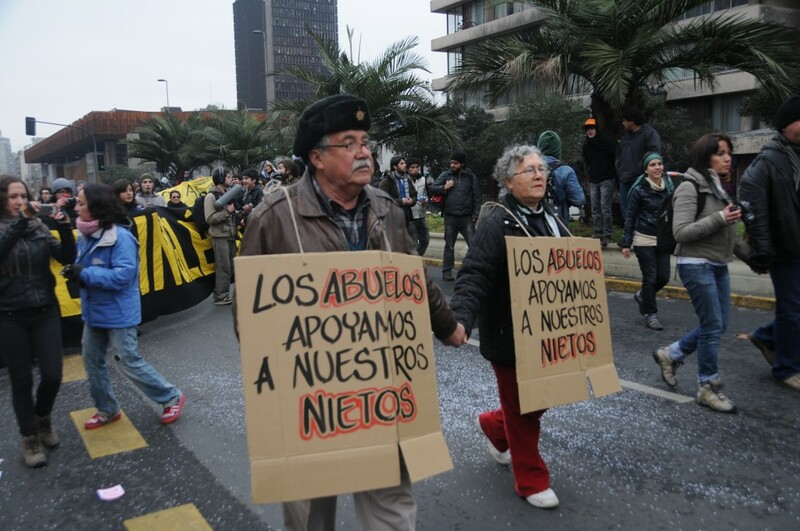 It’s interesting to see what the protests are like in Santiago. Down South they are much smaller, at least in Valdivia. They’re having fun with it down here, having bike protests, singing songs, and dancing. The sad part, besides the universities being shut down, is that the main museums are also closed as they’re a part of University. The thing here was very creative and peaceful as well. Now there’s rumors circulating that some of the violence was seeded by the police. I don’t know if it’s true, but either way, it was a small group that made it happen. One day I’ll see Valdivia without the horizontal rain. Please do not feed me sea urchins! And I hope we see a (good) end to these protests, soon! 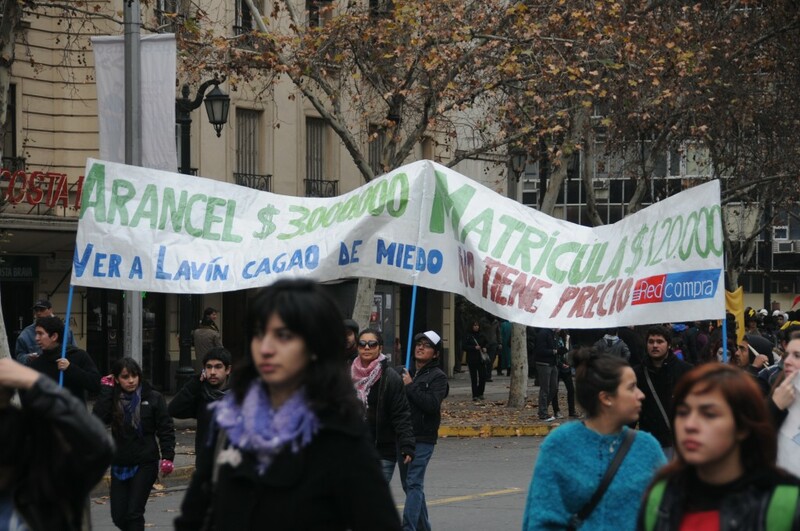 In short, what the students (and it seems most people) propose, is to reduce the military spending (with only 1% to 3% of that you can provide free superior education for all, Chile is a small population country, by superior I mean universities and institutes)This means that you don´t even have to raise taxes. Finally, they protest about the profit focused model Chilean education has, that allows some institutions to teach careers knowing their students won´t have any jobs, and in the meantime, they ally with banks to provide credit for them, so in the end, you get a person with a useless degree, and up to the neck in debts. Marmo, thanks so much for your concise explanation of what’s going on and what people think is a reasonable solution. As always, you’re very informed! Also thanks for the photo kudos. I wouldn’t say they’re my best, but at least they showed some of the super fun and entertaining stuff that was going on before all hell broke loose. I wonder what’s next. As always, thanks for the coverage and the pictures! It really frustrates me that these protests always end in such destruction. I wish that vandals could just do their vandalism separately instead of tainting worthy causes like the environment and education with their actions and taking the news coverage away from the important stories to focus on glass breaking and rock throwing. In Plaza de Armas, there was a group of protesting students who spent a good hour or so dancing cueca… I found that a rather creative form of protest, and great to watch! that’s awesome! when was that? And where was I? I should give out my phone number so people could call to advise. Except I nearly never answer it, so that would be kind of lame. Thanks for letting me know!